I have been wanting to make a chocolate nugget cake for years and a perfect reason to do so just came up: I needed a gift for a birthday party I am going to tonight and since my friend's name is derived from the word "flower" in French, I immediately thought about the "Hello" collection. The concept is not mine and if you'd like to make one yourself, just search for "nugget cake tutorial". You will find many versions. I looked at several to make my own. I wrapped all the (Hershey) chocolate nuggets with patterned papers from the "Hello" 6x6 paper pad. The navy paper on the base is also from that pad. Several Doodlebug doilies (over strong cardstock) separate each tier. 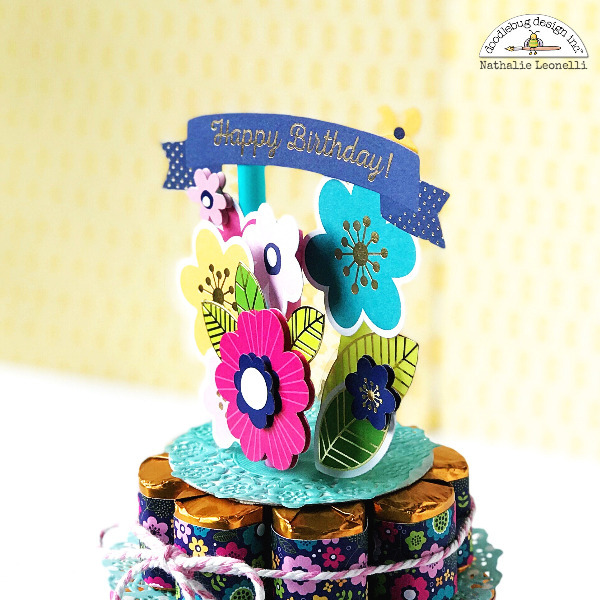 For the topper, I used a Doodle-Pop (pink flower in the forefront) and added many die-cuts from the Odds & Ends pack. The birthday banner comes from the Chit Chat pack (all from the "Hello" collection). There are three straws that support everything. The key here was to create depth with many layers. To finish off, I added my friend's name with some Abigail alpha stickers on the second tier of the cake, tied some chunky twine around the top tier and made a quick card to match (keeping it simple so that it wouldn't take away from the cake). I absolutely love the gold foil touches in the paper, the banner and the flowers!!! They go so well with the chocolates! ... I can not wait to see her reaction! Do not hesitate to leave me questions in the comments! Happy crafting! 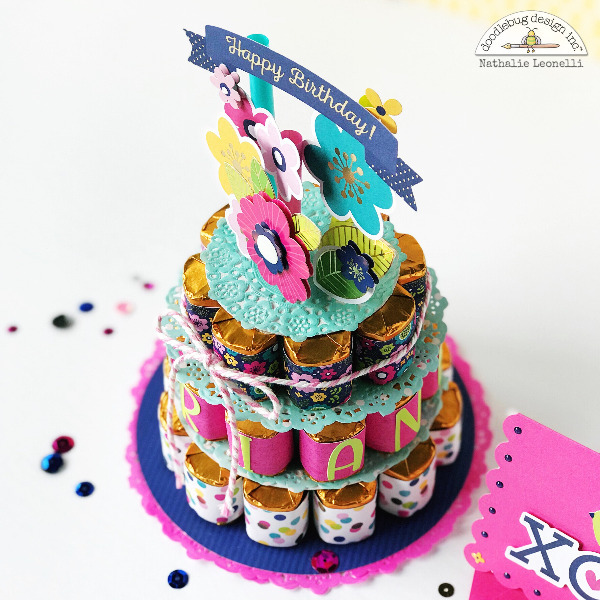 Can you show the back of the topper? I would like to see how it is all attached. Hi Pami! I am so sorry I never thought about taking a photo from the back and I just gifted to cake! Basically, I have three fat straws (from Ikea) sticking out of the top and I glued flowers/leaves on the straws with pop dots or onto each other. I hope that make sense! And if I ever make another one, I'll remember to take a photo from the back! It was a hit :) Thank you Kathy! What a cute birthday gift! I have never seen a nugget cake before. Thanks for the inspiration! I am going to make these for my friends at work!!! Love the Hello papers, I just bought a kit! What a fun gift! I must try this sometime soon as I am always looking for fun and unique gift giving ideas. Thanks for the inspiration.